Elevated between 4354 ft and 9672 ft, the Ski Resort is among the 15 highest elevated Ski Resorts in Italy. The vertical drop from summit to base is 5318 ft. The average difference in altitude between base and summit of Ski Resorts in Italy is 3087 ft. Most runs are therefore relatively long. Macugnaga is among the 5 best rated Ski Resorts in Piedmont. It is among the 10 most family-friendly ski Resorts in Piedmont. Season starts on Dec 7 and ends on Apr 28 (142 days). Average season duration in Italy is 130 days. Average snow depth during the season (Dec 7 to Apr 28) is 37 " at summit elevation and 7 " at base elevation. Snow coverage is usually best during April, offering an average snow depth of 37 " at summit elevation and 8 " at the base. Therefore Macugnaga is among the 3 ski Resorts with best snow conditions in Piedmont. Macugnaga features 79 sunny days on average per season. The average for all ski Resorts in Italy is 71 sunny days. April is the sunniest month with an average of 19 sunny days. Offering 20 miles of slopes and terrain, Macugnaga is among the 5 largest Ski Resorts in Piedmont. Macugnaga, an ancient village in Piemont, is situated in the Monterosa massif. The ski resort doesn´t count among the biggest, but has its very special features. Especially those who´ve had enough of the hustle and bustle in the big, fancy ski resorts willl love this place. Here, it is nice to relax a little while exploring a considerable variety of slopes. There are over 30 kilometers of slopes, most of them are for advanced skiers. The ski resort is divided into two areas: Belvedere and Monte Moro. Belvedere is the area for beginners. There are mostly blue and some red slopes. Underneath Monte Moro lies the resort´s area for advanced skiers and experts. 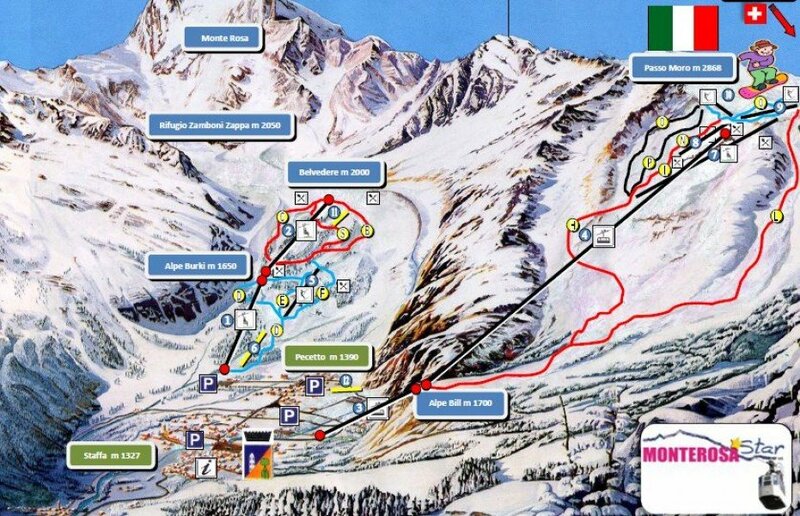 Here you´ll find mosty red slopes and two very challenging black slopes. There are also a few blue slopes for the beginners who prefer skiing in the montain air of bigger heights. No matter where you are, you´ll always quickly find one of Macugnaga´s numerous lodges to stop off at and have a bite to eat and a hot Jagertee.